Yesterday’s “unlawful enemy combatant” is today’s “law of war” detainee. Yesterday was Bush; today is Obama. President Obama has addressed many crucial and negative aspects of the Guantanamo Bay, Cuba prison camp — such as beginning to bring some prisoners to trial and deporting others — but “several dozen” prisoners will still not have charges filed against them when the prison soon relocates to Illinois. 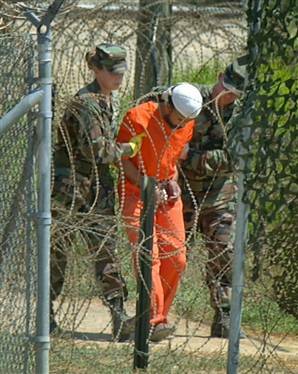 Like Bush’s “unlawful enemy combatant” name for prisoners, Obama’s “law of war” detainee is simply repackaging. In both cases, the powers that be believe the detainees are ineligible for prosecution and too dangerous for release. One question: If Khalid Sheikh Mohammed can be tried in a U.S. court, why can’t the guys that didn’t plan the 9/11 terrorist acts be tried in a court of law? Apparently, just because it says “law” in the title, that doesn’t make it a justice. “The only thing that President Obama is doing with this announcement [of Gitmo closing] is changing the ZIP code of Guantanamo,” Thom Parker, Amnesty International USA policy director, told the New York Times. These Gitmo actions are another example of Obama being just a better — not great — president.